Welcome to Paris. The City of Light is the host city of this season’s sixth ePrix and fans are in for fabulous action on and off track. 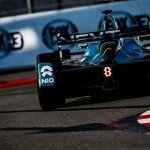 e-racing.net gives you a unique insight into the French highlight on the calendar. Taking place around the historic Les Invalides complex in the middle of the Parisian city centre, the Qatar Airways Paris ePrix is definitely one of the most scenic tracks on this year’s calendar. Only 1,9 km long, the track provides the drivers with a real challenges as they are confronted with fast straights as well as tight corners that do not excuse even the slightest of mistakes – and no one should take turns 11, 12 and 13 easy. These track characteristics make the set-up of the car especially tricky for the teams and drivers. When Paris was announced as a new host city in time for season two, the fans were not the only ones excited about the new addition to the calendar. 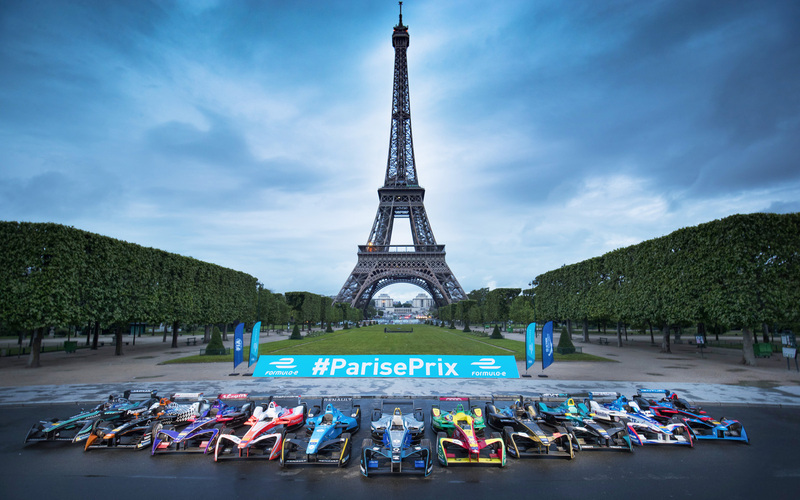 The teams and drivers were looking forward to racing in one of the most beautiful European city centres and the race provided a lot of action so it is no surprise that the Paris ePrix quickly became an institution on the Formula E calendar. Just like last year, this year’s ePrix has been completely sold out weeks ahead of the ePrix, but once again: no surprises there. With the track being located right within the scenic and historic Les Invalides complex in the heart of Paris, Formula E’s guest appearance in the French capital offers so much more than just fantastic racing. Fans get the chance to get a good taste of what Paris has to offer when they want to trade the track walk for sightseeing and the buzz of electric cars for experiencing the French joie de vivre. Less than two kilometres to the West, people get the chance to see one of the most famous European landmarks – the Eiffel Tower. A walk along the Seine offers many more feasts for the eye on either side of the bank, such as the Arc de Triomphe, the Musée de Louvre as well as Notre Dame further to the East. HOW WELL DO YOU REMEMBER LAST YEAR'S EPRIX? 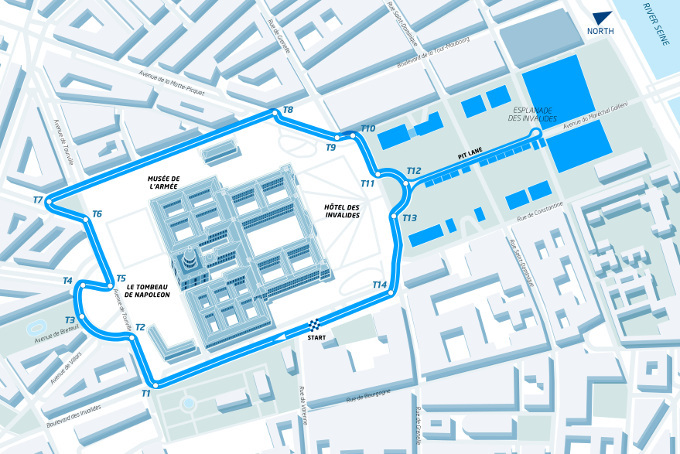 The long-awaited first ever ePrix on the streets of Paris got the fans clued to their TV screens as the race developed as a real nail biter during the start. Pole-sitter Sam bird (DS Virgin Racing) experienced a rather weak start to his race, with ABT Schaeffler Audi Sport driver Lucas di Grassi could instantly get into a position to attack the Briton. The championship leader then was the first going into the first corner, establishing his lead. The two Frenchman Jean-Eric Vergne (DS Virgin Racing) and Nicolas Prost (Renault e.Dams) both got away when the lights went out, securing P2 and P4 respectively. After an unfortunate qualifying, Antonio Felix da Costa (Team Aguri) moved up to P7 during the early moments of the Paris ePrix until he was overtaken by Sebastien Buemi (Renault e.Dams). Simona de Silvestro witnessed a less lucky beginning to her race, as she was demoted to P15. During the first lap, di Grassi was already able to build up a big gap between him and the battling DS Virgin Racing duo in 2nd and 3rd. The real action was happening further down the field anyway as the top-5 quickly settled into their respective positions. Team Aguri rookie Ma Qing Hua showed an impressive debut, first bravely overtaking Venturi’s Mike Conway and then passing de Silvestro in a similarly courageous way, moving up to P14. The race developed less fortunate for Dragon Racing driver Loic Duval who already struggled with the set-up of his car during the previous sessions. His rather dark weekend on home soil ended in technical problems which forced him to retire from the race on lap 6, causing a Full Course Yellow. Nevertheless, most drivers maintained their positions at the end of the FCY but NEXTEv TCR driver Oliver Turvey became an easy target for a handful of drivers within the next few minutes. Robin Frijns (Amlin Andretti) was moving up the field, first overtaking da Costa and then making a brave move on Turvey only a few moments later. Buemi had pushed past Turvey earlier on thus slowly making his way towards the top-5. Most drivers had found their rhythm during the first ten laps of the inaugural Paris ePrix, so the times started to drop. The DS Virgin Racing duo was slowly able to gain on race leader di Grassi but could not yet bring themselves into a position to attack the Brazilian. Buemi nevertheless managed to overtake local hero Stephane Sarrazin (Venturi) and thus found himself right behind his team mate Prost. Wheel-to-wheel action was provided aplenty by da Costa and Turvey who were involved in an intense fight for P8. Reaching half-time, the drivers slowly had to make their ways to the pits for the mandatory car swap. Nelson Piquet Jr (NEXTEV TCR) was the first driver to complete his stop, followed by da costa, Conway and Ma who all stopped earlier than the majority of the field that arrived in the pits one lap later. It was especially close between the DS Virgin Racing duo and the two Renault e.Dams drivers who were already piled up when they turned into the pitlane. Race leader di Grassi experienced a problem-free stop and could regain his lead when Nick Heidfeld (Mahindra Rcing) and Daniel Abt (ABT Schaeffler Audi Sport) completed their stops one lap and two laps later respectively. Meanwhile, Buemi was able to pass his team mate when exiting the pits and showed ambitions to challenge the two DS Virgin Racing drivers for their places on the podium. Buemi continued his pursuit during the last third of the race and was able to put pressure on Bird in P3 which allowed Vergne to establish a gap between himself and his team-mate. The battle for P3 got more and more intense in the cause of the race and eventually brought Buemi into a position to pressure Bird into a mistake. The Brit spun but was able to recover from his mistake, nevertheless losing a lot of time and dropping to P6 overall. The last few laps of the race saw Buemi catching up with Vergne while Sarrazin was closing the gap to Prost in P4. Yet their battles were brought to a quick end when Ma brought the Qualcomm Safety Car onto the track. He lost control of his car but was luckily able to leave his car healthy. The unfortunate incident brought an early end to Ma’s so far strong debut in the Formula E championship. 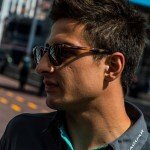 The Safety Car did not leave the track in time for the drivers to restart the race therefore writing a rather unique history with the first ever Formula E victory under the Safety Car. Lucas di Grassi emerged as the first ever Paris ePrix winner with local hero Vergne in P2 and Buemi as 3rd. The top-10 was completed by Prost, Sarrazin, Bird, Frijns, da Costa, Senna and Abt.